In the period from July 25 to July 28, 2018, several manifestations were held in Washington, D.C. marking the 100th anniversary of the alliance between Serbia and the United States. On July 28, 1918, the US President Wilson issued a Proclamation when, as a sign of gratitude to the Serbian people and their Army for the contribution in the First World War the flag of Serbia flew over the White House and other institutions in Washington. The organizers of the anniversary are the Embassy of the Republic of Serbia in Washington, the Serbian Orthodox Church in the United States and representatives of Serbian organizations and the Serbian community in the United States. 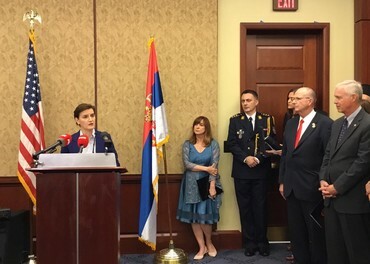 On the occasion of this meaningful anniversary, a reception was held at the US Congress, attended by the Prime Minister of the Republic of Serbia, Ana Brnabić, and the Minister of Foreign Affairs of the Republic of Serbia, Ivica Dačić as well as the President of the Government of the Republic of Srpska, Željka Cvijanović. 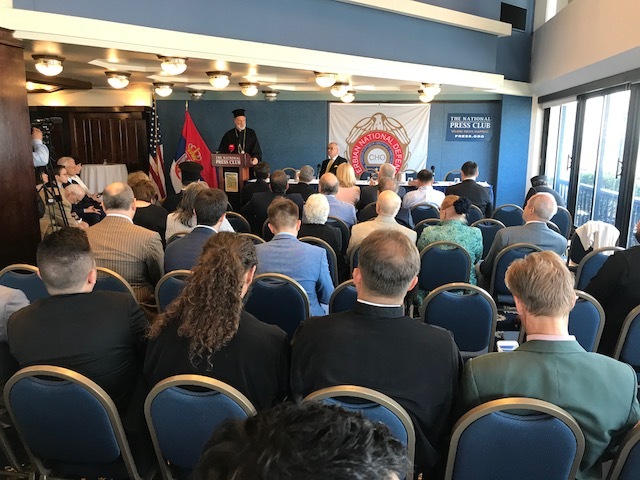 The attendees were addressed by the Prime Minister of the Republic of Serbia, Ana Brnabić, Serbian Caucus Co-Chair Ted Po, Sen. Ron Johnson, Deputy Assistant Secretary of Defense Lora Cooper and Bishop Irinej of Eastern-America. The significance of this anniversary celebration, as well as readiness for further improvement of the bilateral relations between Serbia and the United States, was emphasized on this occasion. President of the Government Ana Brnabić handed the medal from the President of the Republic, Aleksandar Vučić to Congressman Ted Po which was awarded him in gratitude for his contribution in strengthening ties between Serbia and the United States. Bishop Irinej of Eastern-America held a prayer at the US Congress, after which members of the Serbian-American community in the United States were able to meet with their representatives in the Congress. A symposium was held at the National Press Club in Washington with the participation of several lecturers who spoke about the alliance between the American and Serbian people during the First World War, as well as the contribution of the Serbian army and the Serbian people - especially the participation and contribution of Serbs from America - in achieving the great victory. The exhibition "There, Far Away: 1918 - 2018" was presented. Following the reception organized by the Republika Srpska Office and with the participation of the President of the Government of the Republic of Srpska Željka Cvijanović, a concert of the String Quartet of the School for Music Talents from Ćuprija, Serbia was performed at the Karnegi Science Institute in Washington, as well as the Serbian Singing Society "Lira" from the St. Luke Serbian Orthodox Church from Washington DC. The All-Orthodox liturgy and memorial to the victims of the war were held at the Orthodox Cathedral of Saint Nicholas in Washington. The final event was a gala dinner held at the National Press Club in Washington.